First of all you should use a floor cleaner that is recommended by the floor finisher or the company that installed your floor. You can check with a flooring company that sells the type of hardwood floor that you have for specific recommendations. Since the floor is sealed, you can also just use a very mild soap and water to clean your floors. Be careful to not leave any access amounts of water on your floor. Never use ammonia or alkaline products or abrasive cleaners. They will remove some of the surface sealer and leave your floor looking dull and they may even scratch the finish. If you just use water to clean your floors, you will not be able to remove all of the dirt and your floors will still end up looking dull and the dirt will just build up over time. High traffic areas collect a lot of dust and grit. 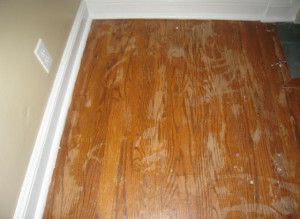 It is really important to sweep this grit up and or vacuum it up to avoid scratching your hardwood floor finish. You may even want to mop every week as well if your floor collects a lot of dirt and dust. other areas can be swept and mopped less often. When you mop on any floor, it is important to remember that water is the worst enemy of all wood floors. never leave puddles of water on the floor. Only use a damp mop to wipe the floor leaving no excess water at all. Always go back over the floor with clean water and a mop to wipe up any remaining soap and dirt that might not have been caught on the first mopping. If you need to remove the old wax, use a stripper design for that purpose and always use a product that has been recommended by the floor manufacturer. Use liquid wax or paste wax to protect your floors. Acrylic and water based waxes can turn floors white, while furniture wax can make floors slippery. One step waxes can also trapped dirt so only use those products that are recommended by the floor manufacturer and speak to someone who has experience in the business. These types of floors should never be damp mopped. Instead just sweep them or vacuum them every week. You may have to strip the old wax and re-wax the floor once a year or more often depending on the amount of traffic on the floor. Always keep the area well ventilated as you work and as the floor dries. Once the floor has dried, apply a thin coat of wax, using an applicator (if you’re using liquid wax) or a cloth (if you’re using paste wax). For added protection particularly on high traffic areas, apply a second coat of wax. Finally, buff. Use a cloth or, to make the job easier, rent a buffing machine. Remember to always buff in the direction of the wood grain. Comments are welcome that will help our readers. We even accept links if your comments are constructive and helpful to our readers. Our next post will be about how you can protect your floors and tackling simple wood floor problems.